Our Texas certified appraisers are the premiere providers of independent residential and commercial real estate appraisals in the Memorial market. We strive to deliver an appraisal report that exceeds our customers’ needs and is delivered with an industry leading turn time. We have some of the lowest appraisal costs in the area and take pride in delivering completed assignments faster than the typical company. Our staff of appraisers are all local to the Houston area and are experienced in performing appraisals for various property types, for all uses including residential, commercial and mixed-use properties. If you have a commercial property that needs appraising our roster of Texas Certified General appraisers can provide you a quote based on the assignment requirements. Additionally, our appraisers are able to provide appraisal services for any use including financing, private issues, insurance, legal issues and any other scenario that demands an accurate and reliable property value. Be it homeowners or industry professionals, our dedication to you remains the same – to offer a reliable and courteous appraisal service. If you have questions, or do not see the precise service you need, you can use our online contact form or phone us directly at the number listed on this website. Getting a quote takes minutes! 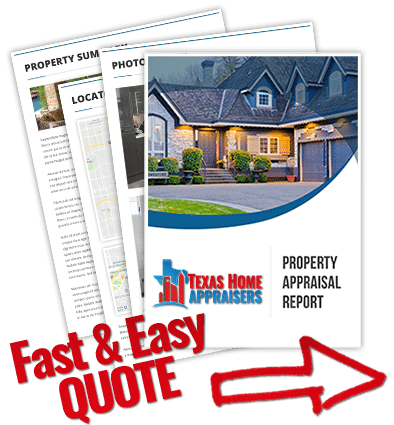 Just use the short quote request form or phone our number above and one of our professional real estate appraisers in Houston TX will be delighted to discuss your appraisal. Does the Listing agent get a copy of the appraisal? If they did not order the appraisal then no. The Listing Agent does not get a copy of the appraisal unless the borrower wants to share the report. We notify the Listing Agent the appraisal arrived and only that it made value (or didn’t make value). No other details are provided . An appraiser should determine the scope of work, follow through with an inspection, and provide an opinion of value to the client. The appraiser will generally consider only permanent fixtures and real property. This information will help to assist the appraiser throughout the valuation and comparison process. The appraiser estimates the square footage (GLA – gross living area), by measuring the exterior of the home. It’s imperative that an appraiser accurately measures and takes out any non-living areas to ensure that the GLA is correct. Are home appraisers influenced by cleanliness or clutter?